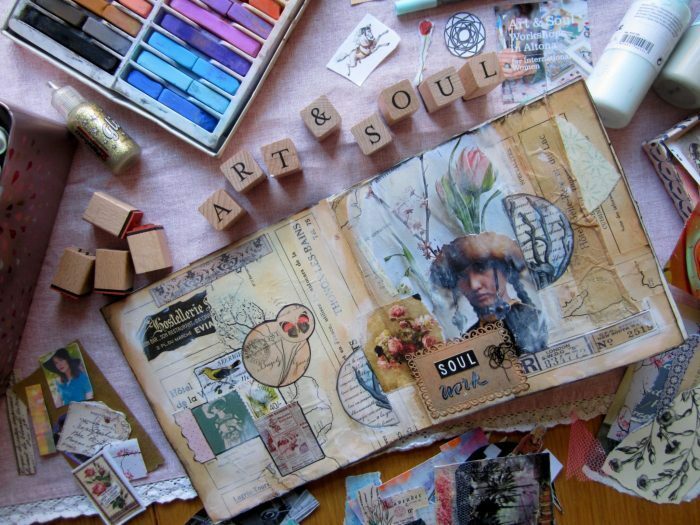 Have you always wanted to try art journaling but don’t know how to get started? Or maybe you have never heard about art journaling before? An art journal is the same as a written journal, except that it incorporates visual content, for example drawings, photos or collages. Why do I love art journaling? Because it’s a wonderful place for experimenting with mixed media techniques and exploring different themes through art making and writing. I use it as a way to relax, connect to my emotions and express myself intuitively. We will start by learning a few fun and quick mixed-media background techniques to break the blank page using different paint mediums, stencils, rubber stamping – extra bonus: I will introduce you to the monoprinting technique. Reflecting on your favorite quote, poem or personal mantra (alternatively pick one from my collection of magical words & quotes) you will create a page spread around your chosen text to make a visual statement and draw out emotion. I will show you different ways how to add texts and words with rubber stamps, stencils, hand lettering and how to further embellish the page with collage. *A detailed material list with product suggestions will be emailed to you after registration. P.S. You have the opportunity to personalize your journal art by working with your own poetry and photographs. So, feel free to bring print outs of text and also images that match the message of your quote or poem. For everyone else I will have plenty of inspirational material to play with. Oh, and absolutely no previous experience or artistic skills are requiered to participate in this workshop, YAY!